With summer fast approaching it’s time to start thinking about all those family get-togethers and evenings out on the patio. And as the long days spill into night, how nice would it be to have an umbrella that provides shade during the day, and illumination at night? After spending a good deal of time researching the available options among patio umbrellas with lights built into them, we’ve determined that the best patio umbrella with lights is the Patio Watcher LED Umbrella. This 9′ diameter tilt-capable umbrella immediately adds a touch of elegance to your patio or outdoor space. It provides you with an element of light in the evening, and shade from the sun during the day. To top it off, there are two ways you can charge it up: with the built-in solar panel at the finial, and a plug-in charger. 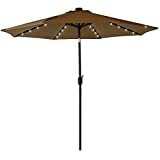 Another great option for LED-lit patio umbrellas is the Sundale Outdoor Lighted Patio Umbrella. The main distinction between the Sundale and the Patio Watcher is that the Patio Watcher has a greater number of LED lights, thought the Sundale has a larger canvas area. In terms of looks and quality, the two are pretty evenly matched. If you’re looking for a larger umbrella canvas, go with the Sundale; if you’re looking for more LED lighting, go with the Patio Watcher. If you’re in desperate need of a lighted patio umbrella but are a little low on funds, be sure to take a look at the Sorbus LED outdoor umbrella. It’s made from high-quality materials and is available in 4 different colors. It’s durable enough that it should last a few summers and it won’t cost you the earth either, but you’ll likely have to replace it after a few seasons. As with all patio umbrellas, they need to be weighted down sufficiently before opening. Proper weighting will ensure that your umbrella doesn’t break or otherwise fall over in a wind gust. If you’re not sure what size umbrella you’re looking for, be sure to consult this umbrella sizing guide for information on what will be ideal for your patio’s needs. Not all umbrella fabrics are equally fade, sun, and weather resistant. Be sure to take a look at our umbrella fabric information for details. Eventually, even the best quality fabrics will start to fade — especially if they are dark colors. By investing in an umbrella cover, you can prolong the useful life of your umbrella canvas, and keep it looking as good as possible, for as long as possible! One of the complexities of dealing with solar panels on the umbrella finial is that covers may cover up the solar panel! Be sure to look for a cover that will work with your umbrella. There’s a bit of a conflict between the solar panel and the umbrella cover: you want to cover your umbrella to keep it lasting as long as possible, but you want full sun to charge the solar panel! Buyers will need to keep this conflict in mind. One way to minimize fading is to purchase a light color umbrella fabric, as these fabrics fade more slowly than dark colors. Also, some models of patio umbrellas have plug-in chargers, which may be a bit more practical than solar chargers. In this review, we will speak about the various components of patio umbrellas. For more information on the parts of an umbrella, see our guide here. In this section, we will look in detail at five of our favorite patio umbrellas lighting systems. We look at the various aspects that make each umbrella stand out, and compare them. In the end, we give our conclusions. Note: this article focuses solely on round patio umbrellas with integrated lighting systems. If you already have your umbrella and want to add lights to it, see our patio umbrella light page. If you’re interested in other canopy shapes, see our rectangular umbrellas with lighting information. The Patio Watcher 9ft, 40 LED solar-powered patio umbrella hits virtually all the right notes and is an outstanding choice among LED patio umbrellas. It has six color options and is very well made. The Patio Watcher umbrella has 40 LED lights, powered by a plug-in charger as well as a solar panel. This design makes charging the umbrella much easier. It also allows buyers to use an umbrella cover in conjunction with their umbrella, which will help keep the umbrella canvas in tip-top shape for a much longer time frame. With nearly twice as many LEDs as most other models on our list, you’ll outshine your whole street with this Patio Watcher LED patio umbrella. Made from high-quality 250g polyester, this material is not only waterproof, but it’s UV resistant and made with high color fastness, meaning it won’t fade significantly in a short space of time. There are also six great colors to choose from. And as mentioned above, this umbrella can be covered while still charging the lights, which is a nice feature! Are are two methods of charging this umbrella: a round solar panel fitted to the top of the canopy and a plug-in adapter. Once charged, the LED lights will provide you with around 12 hours of warm white light when fully charged. The push button tilt and crank system makes it easy to open and close the umbrella, and assembly is so simple it can be done in a matter of seconds. Impressing your guests will not be a problem with one of these beauties on your patio. It may be one of the more expensive models out there, especially given that its canopy diameter is only 9′, but the Patio Watcher Led Patio Umbrella is worth every penny. Made using some of the best materials available, including high-quality 250g polyester and durable, powder-coated aluminum, it’s clear to see why we’ve chosen this as our number one choice. We just wish they had a 10′ model of this umbrella as well! 40 LED Lights: 8 rib construction, 5 LED lights on each rib. Lights are WARM WHITE at night and works flawlessly. Enjoy the ROMANTIC time with your families or friends. 2 Charge Methods: Round solar panel on the top of umbrella for solar energy charge,almost can last for 12 hours. Or use an adapter (INCLUDED), just insert the plug into the socket on the handle. Also an ON and OFF switch on the crank. High Quality: 1.5 inch (38mm) pipe-diameter and powder coated, 8 ribs keep the 9ft patio umbrella more stable. Breathable and 250g/m2 fabric with vent that can block up to 90% of harmful UV rays, not easy to fade with SGS certification. Crank and Tilt: Crank open system can easy to open and close by the crank handle. Tilt with push button for more angles choice when shading. Notice: Heavy Base is necessary (NOT INCLUDED), weight around 40 lb is better. Fold up in blustery and thunderstorm day (also not recommended to use when the wind speed is above 10 mph). Keep cool all summer with this large, 10ft, six rib LED solar umbrella on offer from Sorbus. 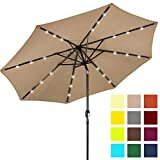 Fitted with 24 warm white solar LED lights, this umbrella will brighten up your environment when the sun sets. It gives off a soft glow, barely bright enough to read by, but quite pleasant for conversation. The Sorbus is an attractive, large format umbrella with a fairly decent tilt system, and is sure to be useful in many patio environments. The Sorbus line of illuminated patio umbrellas are available in 4 different colors, so you should be able to find a color that works here. In terms of how long it will last, you have no worries. The umbrella is made from 100% polyester fabric that’s both UV and fade resistant. If you need to clean your umbrella, simply wipe down with a damp cloth. The pole and six ribs are made from a powder coated steel to ensure maximum durability. Be sure to keep your eye on the pole, and if there are any areas where the paint wears through, spray it with a Rustoleum paint. Commonly this happens at the point where the table meets the umbrella. A patio umbrella cone may alleviate this issue. For ease of use, the pole is fitted with an easy crank lift handle that makes opening and closing of the umbrella a cinch. There’s also a tilt function that enables you to adjust the umbrella up to a 45-degree angle. Assembly is pretty simple and can be done in just a few minutes. Be sure to turn the solar panel on when you first set it up, and there is an on-off switch to engage and disengage the lights. Considering the Sorbus patio umbrella is one of the cheaper models available, it’s impressive how good it actually is. Not only does it look the part but it functions well too. Assembly is simple, and it’s available in a variety of colors. Sure it may not be quite as elegant as the Patio Watcher LED Umbrella, but it’s not a bad choice at all if you’re looking to save some money. For this reason, we’ve made it our budget choice. 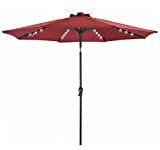 Available in 10 bold and beautiful colors, this LED patio umbrella on offer from Best Choice Products is ideal for keeping cool this summer, and for warm lit evenings under its canopy. Like the Sorbus umbrella above, the Best Choice Products offering supplies light from 24 solar-powered LEDs. The 24 built-in lights on the Best Choice Products line of umbrellas are very energy efficient. They can run for around 9-12 hours when fully charged, and typically give at least 6-7 hours. These warm white lights provide the perfect lighting for your evening get together, and for conversation. As the canvas is made from high-quality polyester, the Best Choice Products line of LED umbrellas is both UV resistant and fade resistant. These umbrellas will last for years to come, though you may want to get a patio umbrella cover to extend the useful life of the umbrella. When the sun starts to get low in the sky, this umbrella has a helpful tilt function to keep the sun out of everyone’s eyes. As the sun sets fully, simply turn the switch on the lights, and the umbrella will charmingly illuminate the evening. Assembly of the Best Choice Patio Umbrella is super simple. The lights are already assembled, so it’s just a case of connecting the battery and connecting it up. Once charged, just prop it open and get ready to light up your patio table. In terms of looks and color choice, you can’t really fault the Best Choice Products line of Solar LED Patio Umbrellas. They’re also easy to put up and take down. And the price can’t be grumbled at either! However, where this umbrella falls a little short is the quality. It’s not in the same league as the Patio Watcher LED Umbrella above. The material on this umbrella is a little flimsy in comparison to some others, as is the actual pole. If you live in an area that has little or no wind you’ll probably be ok, otherwise, you may want to consider another option. See your patio in a different light with this 9ft LED patio umbrella on offer from Sundale! This line of umbrellas features 8 steel ribs, and a handy tilt system that makes your patio a more comfortable environment in the late afternoon. And the lights! With 32 LEDs, the Sundale Outdoor LED patio umbrella shines beautifully, with cool white lights giving a soft slightly bluish glow as evening arrives. With 7 different color options available on the Sundale umbrella, you should have no problems finding a color that fits your environment perfectly! The canopy on this item is made from 180g polyester, and it’s UV resistant, fade resistant, and water repellent. That said, it’s always wise to purchase an umbrella cover to keep your canvas looking as good as possible. Obviously you can’t cover up the solar panel, though. The pole and ribs are made from a rust-free bronze aluminum, meaning it’s both hard-wearing and able to withstand the elements. For additional strength and stability, these umbrellas are air vented at the top. These vents will help airflow, keeping you cooler while providing extra stability at the same time. Turn the lights on and off with ease using the little switch attached to the pole. This will help to save battery power when you don’t need the lights on. To help with easy storage, there’s a handy velcro strap attached to the umbrella. And assembly is really simple too. Just be sure you plug in the solar panel to the lighting system before you charge it up! All in all, the Sundale line of umbrellas are pretty high-quality patio umbrellas. Sundale offers a wide range of color choices available, and the frame and ribs are both sturdy and durable. These umbrellas don’t cost a fortune either. The fact that it has a velcro strap for easy storage is a bonus, and these are positioned at a great price point. There are two major reasons that we’ve put it second to the Patio Watcher LED Umbrella (covered above). The first is the canvas material: although the material is supposed to be fade resistant, is left in the sun over the whole summer, it is likely that you’ll experience some fading. By selecting lighter colors, you’ll keep your umbrella looking as good as possible, for as long as possible. Secondly, this umbrella doesn’t have a plug-in option for charging its lights, while the Patio Watcher does. But, if you’re happy to fold it away or put it in the shade when not in use, it’ll make a fantastic addition to any patio area for many years to come. Convenient crank opens/closes system and handy push button tilt, even easy to use for kids and the elderly. Keep the sun at the back in the daytime. 32 LED Lights with 8 steel ribs and 4 LED lights on each rib, help to light up relaxing night. 100% polyester canopy fabric features fade resistant, water repellent, UV protection. Provide a perfect shade for your patio, garden, deck, backyard, pool. Enjoy warm weather without getting burned. Wrapped with hook & loop strap to protect and store umbrella. keep from bad weather and prolong umbrella's life and appearance. Abba Patio is one of our favorite umbrella manufacturers (and was our Runner-Up choice for Best Patio Umbrella), and this 9′ solar-powered LED umbrella is a pretty excellent umbrella. With 24 LED lights on board, it shines well into the night. And with an easy tilt crank, this umbrella will provide comfort in most any situation. Unfortunately, this line of umbrellas is currently only available in two color options, brown and dark red, which is a pretty significant downer. If you’re looking for a sleek and modern way to light up your patio, then look no further than this 9ft solar-powered patio umbrella on offer from Abba Patio. Available in either a dark red or brown, it’s a fantastic way to shield yourself from the hot sun this summer. There are a total of 24 LED lights fitted to the umbrella, and illumination lasts for around 9-12 hours when fully charged with an easy to get to ON/OFF switch for convenience. Made from a hard wearing polyester material, the Abba Patio should be colorfast for 1,000 hours. Covering it will extend the life of the canvas, but you will run into conflicts with the solar panel. The canopy is fitted with an air vent to ensure maximum airflow underneath the umbrella. Its crank lifting system ensures the canopy can be opened and closed in a jiffy. 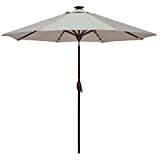 Overall, the Abba Patio 9ft Solar-Powered Patio Umbrella is not a bad choice, but considering it’s one of the more expensive models out there, it should provide a lot of value. It is extremely well made and works very well. The push button tilt feature is a nice added touch too. Assembly is simple and it does look the part. 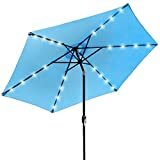 But, considering there are only two color options available, the fact that it is more expensive than the Patio Watcher LED Umbrella, it does seem there are better options out there for a solar lighted patio umbrella. Hopefully, by now you will have made up your mind as to what patio umbrella you’d like to light up your outdoor area. Just to reiterate, if you want an LED umbrella that looks great, is extremely well made, and will keep you cool when you need to, the Patio Watcher Led Patio Umbrella is the best around in our opinion. But, if you want a larger canopy, and aren’t so worried about the multi-functional charge system, the Sundale Outdoor LED Patio Umbrella is another great option. It too looks the part and is available in a wide range of colors. It just doesn’t have quite as many lights.